If you ask the average person what the worst thing about moving is, you are bound to get a laundry list of different reasons why they would avoid the dreaded process. It’s laborious, stressful, time-consuming, and simply unpleasant. Add in elements like a high traffic location and several flights of stairs, and you have yourself a real nightmare situation. One of the worst aspects of moving is dealing with furniture. Furniture is often the biggest and bulkiest items people will have to deal with, which makes moving and transporting them quite difficult. In some cases people will be moving into smaller spaces or getting new furniture, which means they will need to find a proper place to dispose of the items. Unfortunately, some turn to dumping old furniture illegally. Illegal furniture disposal is not only dangerous, but unsightly as well. At Fast Haul we provide an easy solution to your furniture removal needs. We can take care of the pick-up and disposal of any unwanted furniture you have, regardless of size. Unlike other furniture removal services, Fast Haul is committed to conducting business in the most environmentally friendly way possible, which means we go the extra mile to ensure your junk stays out of the landfill. Some furniture disposal companies claim they recycle and donate the old furniture they pick-up, but end up junking it all in the landfill to save a couple bucks. If your old furniture is in good condition, we will donate it and provide you with a tax-deductible receipt in the process. Should the furniture not meet the standards for donations, we will transport it to a reputable recycler who will disassemble the items for dismantling and sorting. Sending furniture to the landfill is the last resort. 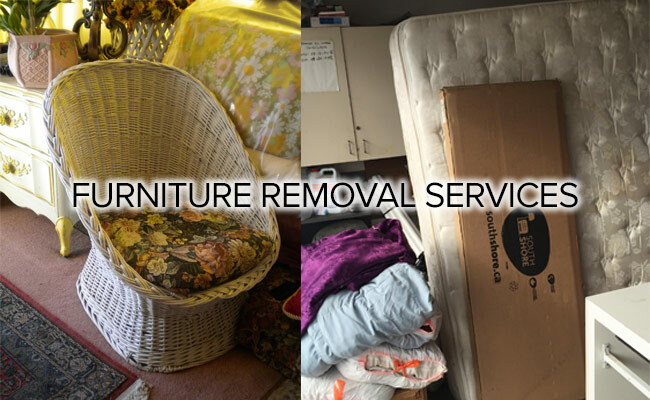 In need of furniture pickup and disposal in the Bay Area? Call or schedule an appointment today! We receive many phone calls every day from valuable customers who are looking for junk removal quotes. We always do our best to give our customers quotes on the phone. However, the most accurate way to get a junk removal price is to have a Fast Haul driver come to your home or business for a free estimate. We are always happy to provide these free estimates for you! Note: All Fast Haul phone quotes are estimates only! Since our founding in 1993, Fast Haul has always had a Green Business philosophy. As one of the Bay Areas oldest junk removal & trash hauling companies, practicing recycling, re-use, and donation comes naturally. It makes our customers feel good as well as keeping costs down and reducing our landfills and dumps. We specialize in Green hauling services.